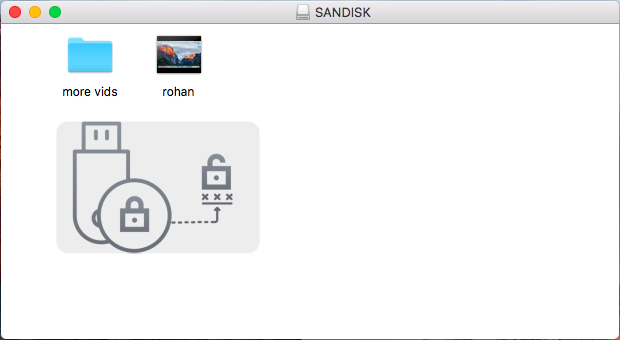 If you have stumbled upon this article, then chances are that you have an encrypted BitLocker drive that you are trying to unlock on your Mac. For those who have no idea what BitLocker is, BitLocker is an encryption feature included in Microsoft Windows designed to protect data by providing encryption for entire volumes. To unlock an encrypted drive, you will need the password or the recovery key. By default, Windows recognises a BitLocker encrypted drive automatically and the user is prompted for credentials to unlock the drive. However, that is not the case with Mac. To read encrypted BitLocker files on Mac, you will require the help of external software and today we will be having a look at the iSumsoft BitLocker Reader for Mac. So what is the iSumsoft BitLocker Reader? iSumsoft BitLocker Reader for Mac is a utility tool that can unlock, open and read BitLocker-encrypted drive on Mac. This tool lets you open, read, write, edit, copy, and delete files in the BitLocker-encrypted drive. Not only can you transfer files, but you can also mount .dmg files with this software. Why choose iSumsoft BitLocker Reader? The iSumsoft BitLocker Reader is a simple and easy to use software. The decryption process is quite easy and you will have access to your data within minutes. The software is completely safe to use and iSumsoft also provides good customer service if in case you have any problems with the software. This software will work on any Mac computers running macOS 10.14/10.13/10.12/ or Mac OS X 10.11/10.10/10.9/10.8/10.7, etc. 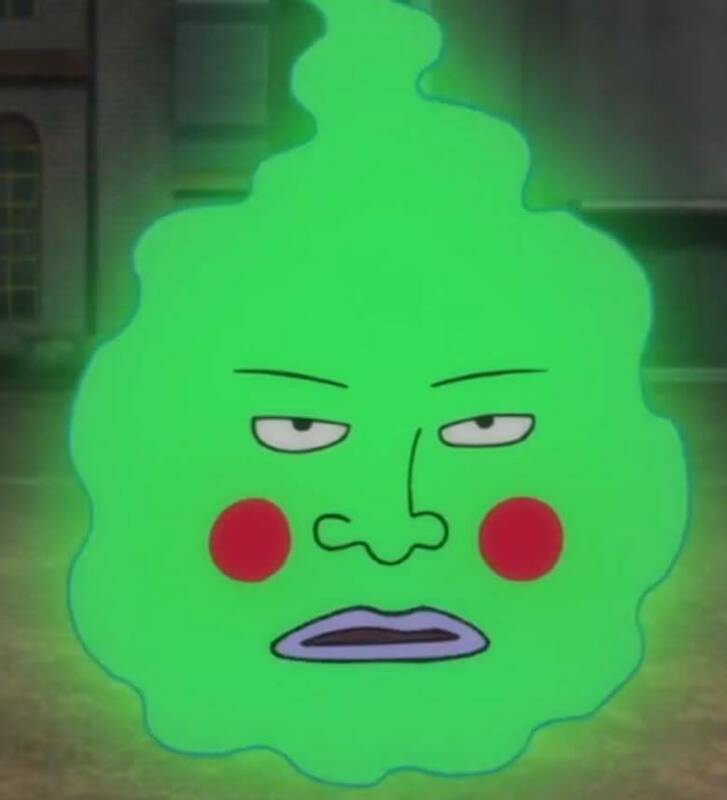 Where can I download the software from and how much does it cost? Before purchasing the software, you will have to download the trial version. 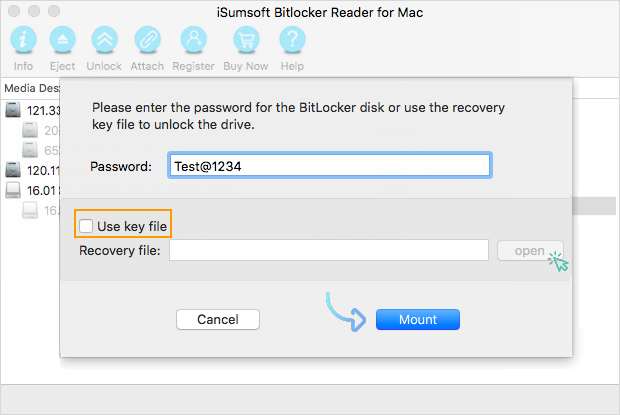 The iSumsoft BitLocker Reader for Mac can be downloaded from here. A single license will cost you $19.99. Once you have purchased the software license, launch the software and click on Register. Then paste the license key which you have received in your email. Lets you open/read/write/edit/copy, and delete BitLocker encrypted files. 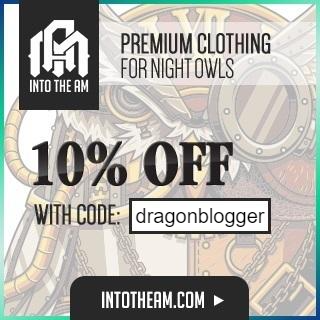 Allows you to open, read and write .dmg files. 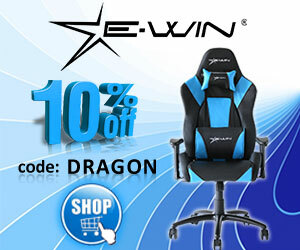 Supports external hard drives, SD cards, MicroSD memory sticks and CF cards. Decrypts BitLocker drives by either using the password or the recovery key file. Works on all MacOS running version 10.7 or above. 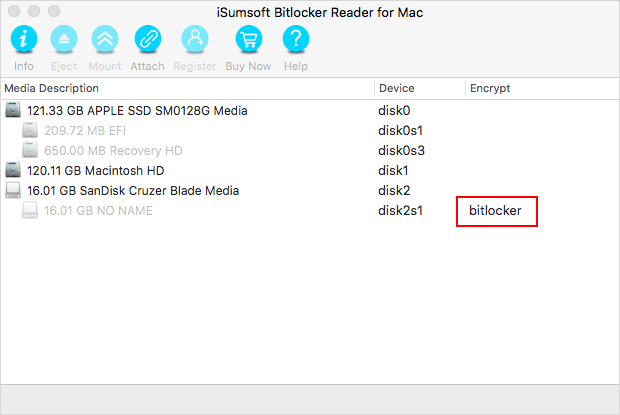 How does the iSumsoft Bitlocker Reader for Mac work? Now that the registration is done, plug the encrypted USB flash drive in your Mac. The software should automatically detect the flash drive and show it on the app. On the right, you can see that the drive is BitLocker encrypted. To unlock the drive, Click on the drive and then click on Unlock. You will get a popup screen where you will have to enter the password and click on Mount. Or you can use the Recovery File option if you have forgotten your password. For those who were hoping that this software will be able to recover the forgotten password of your BitLocker drive, then you might want to look for another software as this one will only let you access your drive if you remember your password or have the recovery file. Once you have entered the password, the drive will unlock immediately. You can then access the drive from the newly created drive on your home screen or you can access it from Macintosh HD. With the help of this software, you can not only read the files in the drive but you can also write files on the drive. To copy paste items, simply drag and drop them from your computer to your encrypted drive. You can also click on Attach to mount or read or write .dmg files to the drive. Once you are done using the BitLocker encrypted drive, click on Unmount to unmount the drive. This will lock the drive again and you will have to enter the password again to unlock the drive. If you want to safely remove the drive, then click on Eject. 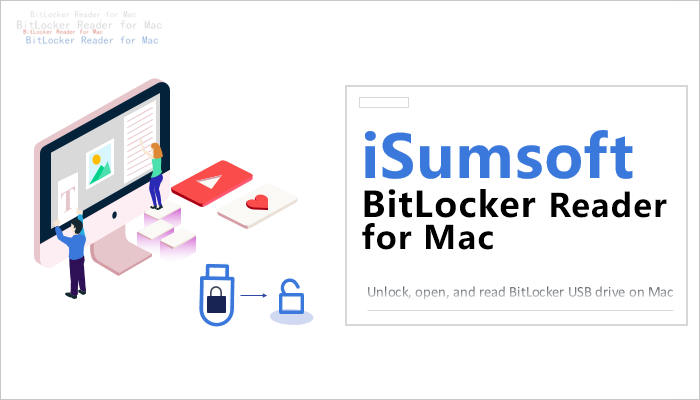 The iSumsoft BitLocker Reader for Mac is a great software for Mac users who are looking to read BitLocker encrypted drives on their computer. The software costs around $19.99 and the pricing is far less when compared to similar BitLocker reader software for Mac. I can easily recommend this software. If this software helped you, let us know in the comments.